Last week, the US army cleared the way for the Dakota Access Pipeline construction to continue, cutting short an environmental viability study ordered by former President Barack Obama that was supposed to take at least 18 months. Caught off guard, protesters are now mobilizing for the second phase of a showdown that, the first time around, took on epic proportions. Late last year, important American values were wrapped up in the fight over the pipeline. Corporate versus public interests, America’s nasty history of oppressing indigenous peoples, the future of the planet, the right to clean water, the right to freedom of expression, and many more issues were fiercely contended in the Standing Rock battle. There’s no reason to expect that passions will be any less heated in the weeks and months ahead. Standing Rock has become a hugely symbolic event, similar to the Keystone pipeline protests, and the people power opposing it could prove too strong. “We are a sovereign nation and we will fight to protect our water and sacred places from the brazen private interests trying to push this pipeline through to benefit a few wealthy Americans with financial ties to the Trump administration,” Standing Rock Chairman Dave Archambault II said in a statement last week. However, law enforcement in the region has been aggressively arresting and charging protesters with civil disobedience and other statutes in an attempt to discourage participation. And the pipeline could now be politicized all the way up to the White House. While former President Barack Obama was cautious when talking about DAPL, careful to avoid taking sides, President Donald Trump eagerly supports the pipeline. Whether this results in US military being deployed to the protest site is uncertain. But that possibility makes the resistance of veterans all the more significant. 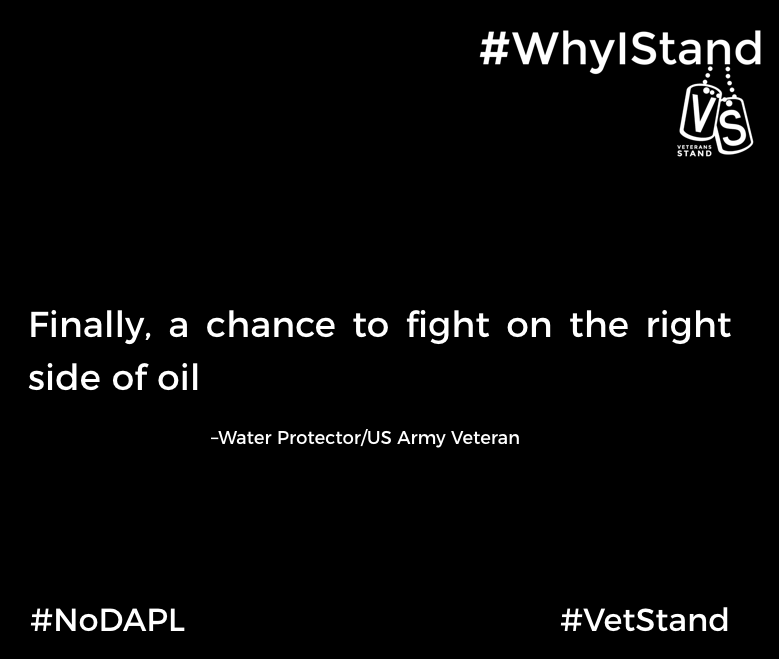 Veterans Stand, a nonprofit that champions social causes of marginalized groups, is currently rallying large numbers to stop the pipeline with non-violent resistance. Veterans Stand captured the country’s attention when they first traveled to Standing Rock in December after raising hundreds of thousands of dollars through a crowdfunding campaign. More than 2,000 veterans provided a peaceful human shield and added an extra degree of credibility to the protest. Prior to their arrival, protesters had been repeatedly attacked by private and public security forces. “[We’re guided] literally by that line to protect and serve against all enemies foreign and domestic that we swore to,” Michael A. Wood Jr., leader of Veterans Stand, told Global Citizen. “I only do as I’m told by the citizens I’m serving,” he said. Now they’ve set up another crowdfunding campaign and are preparing to head to the protest site as soon as possible. They’ve raised nearly $250,000 toward a goal of $500,000. "We have had thousands of volunteers reconfirm their dedication to the cause, and readiness to help," the group said in a statement. "The success of our fundraising campaign will ultimately dictate our overall potential for a boots-on-the-ground presence but our learnings from the first mission in December have allowed us to create the right infrastructure to move quickly." With their tactical experience and the revered place they hold in the public’s imagination, the veterans could be crucial to blocking the pipeline a second time.